Culltus Lake - a recreational area that offers a smorgasbord of outdoor recreational activities for each member of the family - including many different water sports, horseback riding, golfing, go carts, water slides, hiking and much, much more. Cultus Lake is located approximately 90 kilometers east of Vancouver and a short 15 minute drive from the City of Chilliwack. 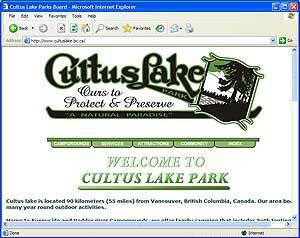 It is a provincial park and is operated by the Cultus Lake Parks Board. There are about 930 year-around residents at Cultus Lake. The population expands significantly during the busy summer months as tourists flock to Cultus Lake to enjoy all that it has to offer.